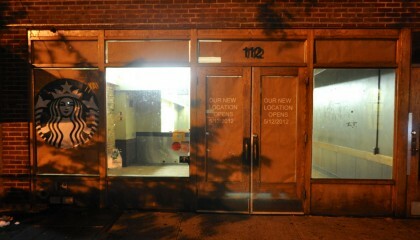 Former Starbucks Locale @ 112 Montague Street: What’s The Deal? Back in May, we wrote about Montague Street’s “resurrection, revitalization, renaissance or recovery,” pointing to the fact that the retail corridor is healthier than it’s been in three-plus years, with a dozen new businesses opening their doors in the past year or so. In all, Montague has seen the coming of: Custom House, Dellarocco’s on Hicks, VIP Nails & Salon, Le Pain Quotidien, Ruby and Jenna, Area Yoga & Spa, Hanco’s and Starbucks’ new home, while we’re still waiting for Ani Sushi, which has been “coming soon” since June. I suspect that this store remains vacant because the landlord wants a rent that is too high for most small business to pay. This is Montague, so odds are the “deal” is that the rent is way too high to sustain any type of just-starting business. Let’s look forward to another national chain or bank! Our Brooklyn, Kansas future here we come! I’m rooting for a Red Lobster here! I heard from a reliable source that Starbucks’ leaving had nothing to do with bad plumbing; the reason was money. 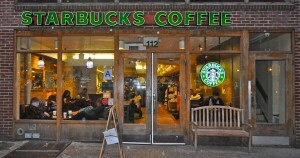 When Starbucks’ lease was up, the landlord wanted double what he had been getting, from 20,000 per month to 40,000. Some time back, it was reported (by whom I don’t remember) that Daniel Boulud (the renowned chef) was interested in the space. In fact, he was quoted as saying something to the effect that he was looking forward to coming to Brooklyn and he could not think of a better place to make his entry than on Montague Street. Was that all a pipe dream???? If you look back, that Boulud post/comment (don’t remember which form it was in) was an obvious April Fool’s Day joke….sorry to burst that bubble…. 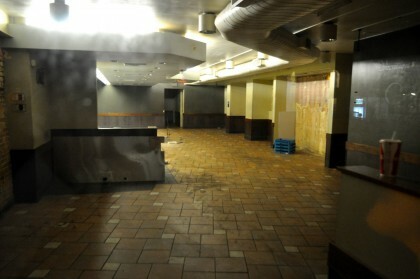 FYI, prior to Starbucks, that entire building was vacant for many years. When I moved into a commercial Montague St. location in 1993, I looked at the space, but the landlord wanted $15k back then. I settled on a location a few doors down that cost $3.4/month. Not sure what year Starbucks moved in, but it was likely 1998-9ish, and the location was empty with a small “For Rent” sign it from at least 1993-8, and likely much before that. It’s logical that the two-story building become another in-fill 5 story residential/commercial place, as AF posts. Very little disruption would occur to Montague’s fabric. I would guess that the site would be sold to a developer who would fill in the five stories. It is a large site and a larger building there is justified. There was probably a five-story building there originally, torn down in the thirties to save on taxes. The Starbucks came in in ’94 or ’95. Before that, it was a Korean grocery. I don’t remember the second floor ever being occupied. I think it was a liquor store in the 80s. Van Vect, or something of the sort. @ Wiley – no Van Vlek was on the other side of Lassen & Hennings. Radio Shack had been China-Chile the best $5 lunch a guy could have I miss Christine and Earl. I called the landlord a few months ago on behalf of a client who was interested in the space. His asking price was ridiculous — I believe it was $40,000/mo (but I forget the exact number). He also denied that there were any plumbing issues or leaks. Maybe that is true. I have no idea. More troubling, however, was that he was a complete jerk on the phone. I called my client and advised that even if the asking rent was in the right ballpark, I would have serious reservations with this guy as his landlord. When you are a restauranteur or retailer, the landlord is, in many respects, like your partner. If you have a difficult one, it spells disaster. This guy was aggressive, abrasive and squirmy on the phone. We went elsewhere. Too bad. Danno is correct, it was a Korean green grocer then Starbucks maybe 2-3 years of vacancy between… Sleepy’s was upstairs for a while, the only 2nd floor occupant since the building was converted from a single story in the early 80’s.